Emerald Ash Borer (Agrilus Planipennis), an ash tree killing Insect from Asia, was identified in Ohio in 2003. This exotic Beetle in its adult stage nibbles on ash foliage and causes little damage. The larvae feed on the inner bark of ash trees, disrupting the tree’s ability to transport water and nutrients. 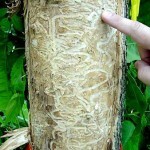 The emerald ash borer kills ash trees within three to five years of infestation. The larvae, which reach 26 to 32mm, are cream-colored and dorso-ventrally flattened. The brown head is mostly retracted into the prothorax and only the morthparts are visible externally. The 10 segmented abdomen has a pair of brown, pincer-like appendages on the last segment. Adult males are known to live an average of 13 days and females about 21 to 23 days. Females can mate multiple times and oviposition begins 7 to 9 days after the initial mating. Females lay 65 to 90 eggs during their lifetime. Eggs are deposited individually on the park surface or in bark crevices on the trunk or branches. Eggs hatch in 7 to 10 days. After hatching, first instar larvae chew through bark and into the cambial region. Larvae feed on phloem and the outer sapwood for several weeks. The S-shaped feeding fallery winds back and forth, becoming progressively wider as the larvae grows. Galleries are packed with fine frass. Individual galleries usually extend over an area that is 20 to 30 cm in length, though the length of the affected area can fange from 10 to 50 cm. The insect over winters as a full-grown larva in a shallow chamber excavated in the sapwood. Pupation begins in late April or early May. Newly enclosed adults may remain in the pupal chamber for 1 to 2 weeks before emerging head first through a D-shaped exit hole that is 3 to 4 mm in diameter. The emerald ash borer appears to have a one-year life cycle in most climates, but can require two years to complete a generation in colder climates. Adult emergence begins in mid to late May, peaks in early to mid June, and continues into late June. The adults are active during the day, particularly when conditions are warm and sunny. Most beetles remain in protected locations in bark crevices or on foliage during rain, heavy cloud cover, high winds, or temperatures above 90F. Adults are usually present until August and feed on up to .45 cm of folage per day, leaving irregularly-shaped patches of leaf tissue with jagged edges. Infestations of Emerald ash borer can be difficult to detect until canopy dieback begins. Evidence of infestation includes D-shaped exit holes on branches and the trunk. 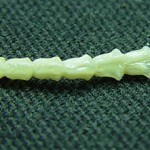 Callus tissue produced by the tree in response to larval feeding may cause vertical splits 5 to 10 cm in length to occur in the bark above the gallery. Distinct, frass-filled larval tunnels etch the outer sapwood and phloem of the trunk and branches. An elliptical area of discolored sapwood, likely a result of secondary infection by fungal pathogens, sometimes surrounds larval feeding galleries in live trees. Keep in mind that treatment is REQUIRED every 2 years to protect an individual tree. This is a long term commitment, and skipping a year may render the entire treatment regimen worthless. It is important to decide if an individual tree is worthy of the long term investment REQUIRED to protect a tree. It is now recommended that trees deemed worthy of saving be treated every 2 years if they are located within 10 miles of a known infestation. 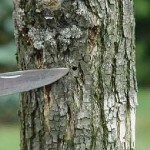 If your property contains a large number of ash trees, you should devise a strategy of selective removal and replacement to ease the impact when the borer moves in. With the find in Anderson Township in 2007, Hamilton County, portions of adjacent counties, including Northern Kentucky, are now all affected. An intensive, stepped up program is recommended as an infestation sweeps through a given area. Hyde Park Landscape & Tree Service provides these treatments, as well as information necessary to make an informed decision. Call us at (513) 731-1334 to talk to one of our specialists. We take great pride in our landscaping and tree removal work. Hyde Park Landscape & Tree Service is fully licensed and insured. ©2019 Hyde Park Landscape & Tree Service All rights reserved.